(ca. 1915-16) Reportedly born in Russia to French parents, Edward Platt-Ruskin went to England around the turn of the century. While in London ca. 1904 he “discovered” the three Russian-born Cherniavsky brothers, one of the most celebrated juvenile musical ensembles of the early 20th century. He brought the trio to Australia in 1914 shortly before the outbreak of war. 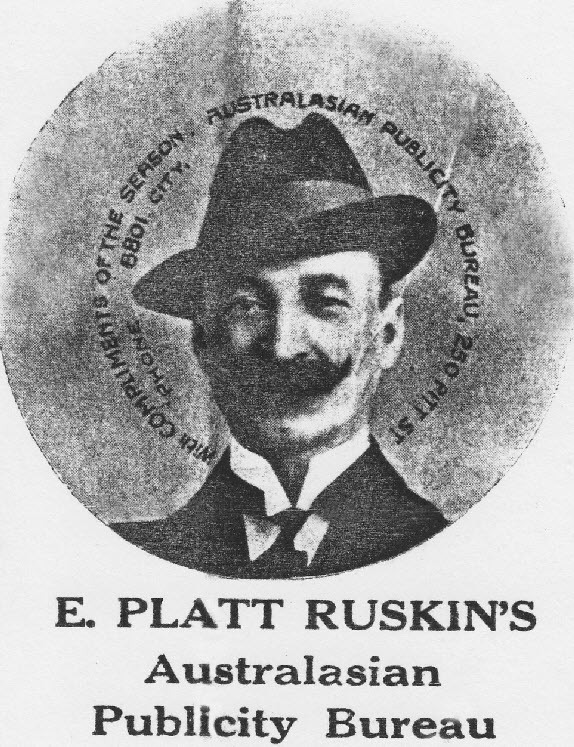 Over the next two years Platt-Ruskin established the first hospital war fund, helped organised several other patriotic appeals, promoted concerts and set up the Australasian Publicity Bureau, a button manufacturing business. In addition to patriotic buttons the firm also promoted vaudeville stars of the time – including Dan Thomas, Carrie Moore, and Daisy Jerome. 1: Ruskin left Australia in 1916 with the A.I.F. as an artilleryman and later settled in the Middle East as an interpreter. It was not his first experience as a soldier, having served as a private in the Russian army during the years 1897-98 (he was stationed with the 99th “Urievsky Regiment, 25 Division at Dvinsk). 2: Platt-Ruskin operated the “Australian Bar” in Beirut during World War II, and became known to Aussie diggers as “Anzac Harry.” An article published in the Courier Mail in 1940 describes him as a jovial grey-mustached-fellow (20 May 1940, 4). Image source: Australian Variety (Sydney) 20 Oct. 1915, 10. Residences specifically catering to professional actors, variety entertainers and associated practitioners were established in all of Australia’s capital cities, as well as in some of the larger regional centres, from the late 1800s. 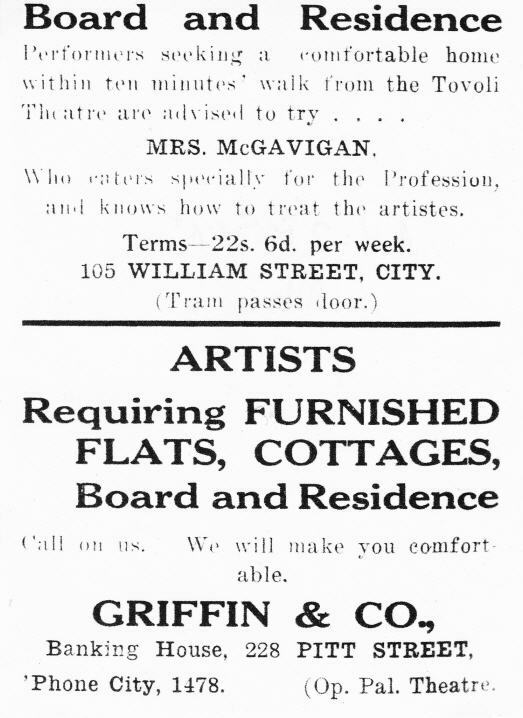 Typically located within the CBD, and close to both the major theatres, and train, and bus and tram services, these homes away from home were often operated by individuals with links to particular theatres and/or theatrical firms. Advertising also tended to be published in trade magazines only. Among the Sydney B&Rs to have been identified to date were: Mrs McGavigan (William St), Griffin and Co (Pitt St) and Mrs Chadwick (Scotland House, Albion St). Image source: Australian Variety (Sydney) 23 Sept. 1914, 10. 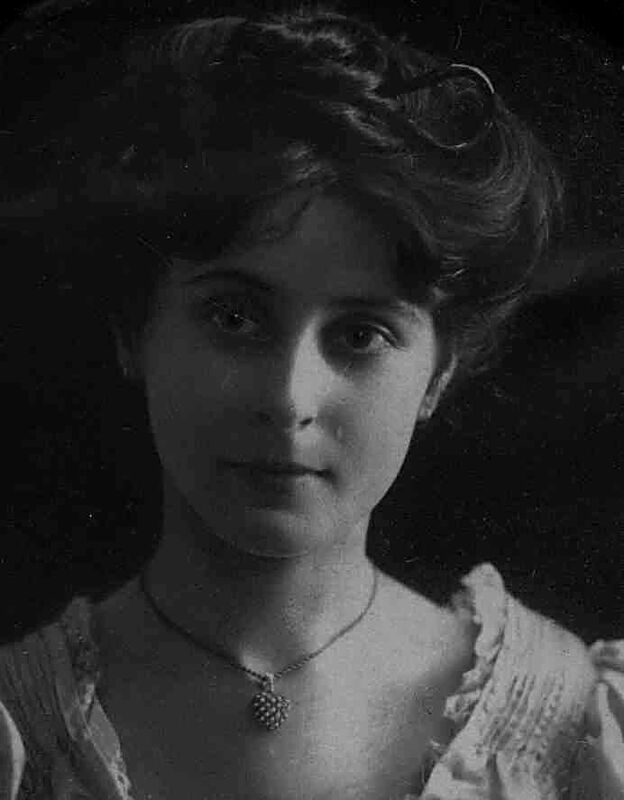 Mendelssohn and Company, High Art Photographers was established in Melbourne in 1880 and was eventually acquired by Theresa Greenberg (below). She later ran it with her husband Louis Solomon. Popular with actors and entertainers, many of their portraits were published in various industry magazines and newspapers. The company did not begin photographing performances or stage companies until 1941, however. A trail blazer for the women’s liberation movement, Theresa Solomon successfully ran the business after her husband’s death in 1926 while also raising their young family. (1895-ca. 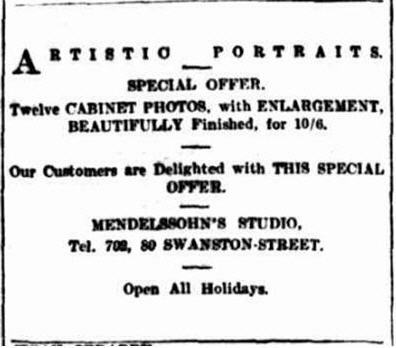 1949) One Australia’s most successful photographic companies of the late-1800s and early-1900s, Talma was founded in Melbourne (79 Swanson S) by Andrew Barrie and Sir Henry Weedon. It expanded to Sydney in 1899 (374 George St) and had studios in other cities in later years, including Adelaide (31 King William St). Talma was in particular demand with theatrical performers, and over the course of its lifetime produced thousands of portraits and postcards for actors and entertainers. Shortly before World War II the company was acquired by Theresa Solomon of Mendelsson’s Photographic Studios and renamed The New Talma. Image source: Sydney Morning Herald 15 June 1901, 2. Valentine Morgan (1876-1952) founded his advertising business in Little Collins Street, Melbourne in 1894. For the first thirty years, however, he spent most of his time on the road soliciting advertisements throughout regional Victoria. It was not until 1914 that Morgan focused his attention on cinema advertising. Up until then advertisements for his continually expanding clientele appeared almost exclusively in venues that primarily offered theatrical entertainments (including minstrelsy, vaudeville). By the time of his death he had built the company into the largest cinema advertising company in Australia. Morgan’s other activities included ownership of Melbourne radio station 3KZ and Morgan’s Street Directory (1916-ca.1970s). Image source: Everyone’s (Sydney) 1 Oct. 1924, 3. 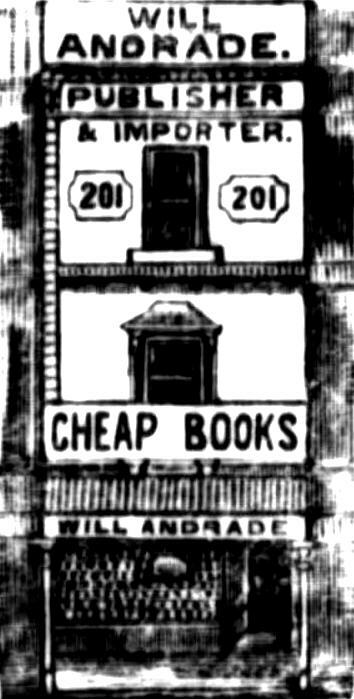 The Will Andrade bookshop in Melbourne was founded by William Charles Andrade (1863-1939) in 1898. His interest in the theatre saw him specialise in selling plays and other related publications, along with theatrical supplies (including props and conjuring equipment). The business also operated as a small publishing house. 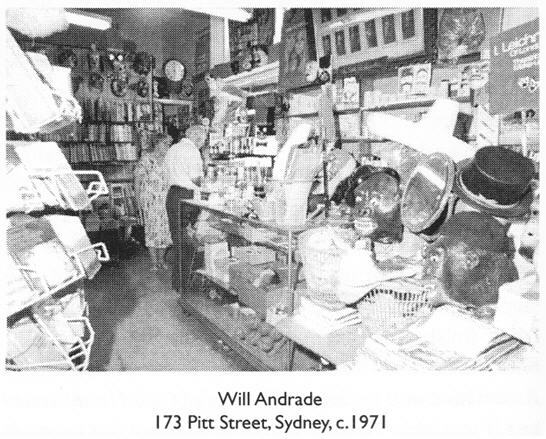 Andrade expanded to Sydney in 1920 and relocated his Melbourne store in 1922. The Melbourne shop was managed by his son, Bill, from 1936 but following Will Andrade’s death his wife sold it to Allan’s. 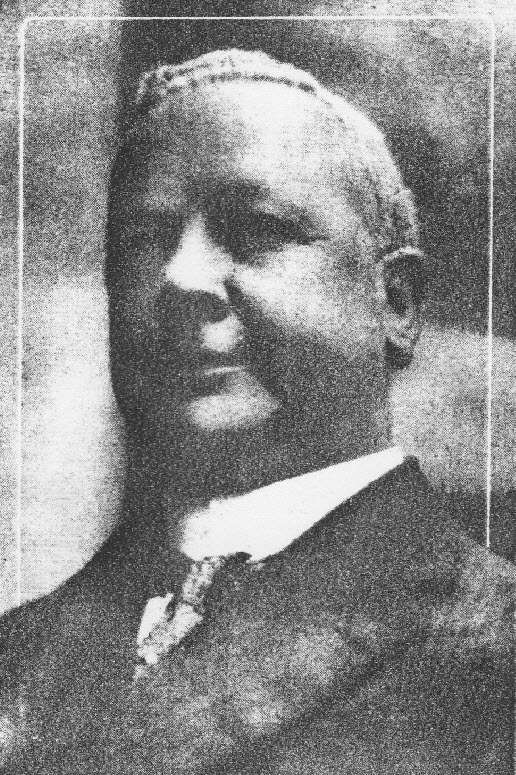 The Sydney store, and the rights to the name, were acquired by magician and long-time employee Harry Job. For further details on Will Andrade (business) and William Charles Andrade see: Bertha Walker. “Andrade’s Bookshop.” In Solidarity Forever: The Life and Times of Percy Laidler. (1972) [sited 1/06/2014] • Andrew Reeves. “Andrade, William Charles (Will) (1863–1939)” Australian Dictionary of Biography 7 (1979). Andrade’s wife, the playwright Hilda Champion Andrade, managed the Melbourne store for Allan’s following its sale (the shop continued to be known as Will Andrade for many years). Socialist leader and Industrial Workers of the World (I.W.W.) activist Percy Laidler was employed at the Melbourne shop for a number of years from 1911. Andrade died as a result of a surfing accident at South Steyne Beach on 11 November 1939. Image source: The Clipper (Hobart) 18 Aug. 1900, 6. Magician Harry Job bought Will Andrade’s Sydney shop and the rights to use the name from Andrade’s widow, Hilda. Job had been employed at the Rawson Street shop since 1923 (aged 14) and eventually took over the Magic Department, entertaining prospective customers with displays of conjuring and other trickery. From 1940 he became known professionally as Will Andrade (both as a magician and business proprietor). He relocated his shop to the School of Arts building in Pitt Street in 1971, running it in partnership with his wife and stage assistant, Thelma (aka Wilma Andrade). Image source: Thelma Job. Melodies Magic Memories (2003), 118. 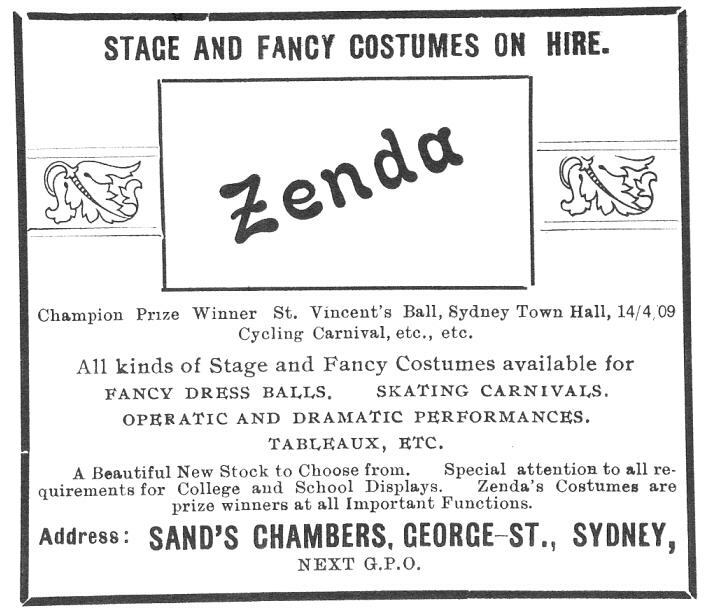 (1908-1916) Established by Stanley McKay and Adeline Miller (designer), the costumier business Zenda was located in the Victoria Arcade, 376 George Street, Sydney (opposite David Jones). In addition to hiring out fancy dress to the public, Zenda also designed and supplied costumes for the theatre industry, including McKay’s Sydney Muffs and touring pantomime companies. The business was servicing capital cities and regional centres around the country by 1910. A fire severely damaged its Sydney premises in June 1916, less than two months before McKay left Australia with the Australian Imperial Forces. The remaining stock was eventually sold to Mascotte’s Fancy Costumes. Image: Theatre Magazine (Sydney) Dec. 1909, 29.